You use awesome Boylan's soda bottles that give you a classy vintage look that is timeless and looks amazing in natural light. My favorite bottles are the colored ones, like this beautiful hunter green one. I didn't have extra vase for the parts of my Birthday flowers that weren't dying. I only needed small ones, so I grabbed a few of these bottles that I ALWAYS save for projects and Voila! Instant vase. So pretty isn't it? I love the contrast of the peachy pink roses and the purple against the green. It's so simple yet so great looking when setup. 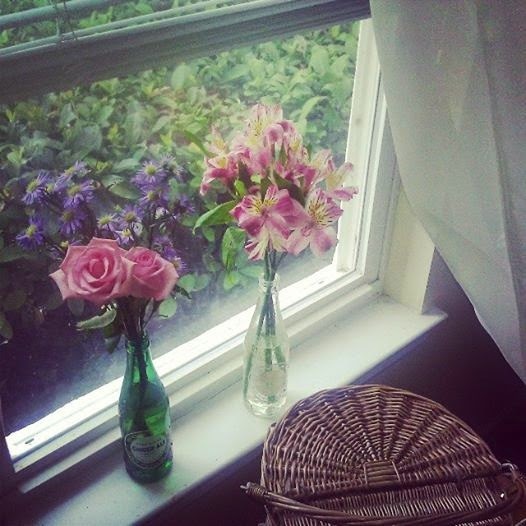 Try putting 2 or 4 of them with different flowers in each right on the window sill. It will look gorgeous! When you're done, make sure to Instagram that beauty to give it an even more vintage appeal.